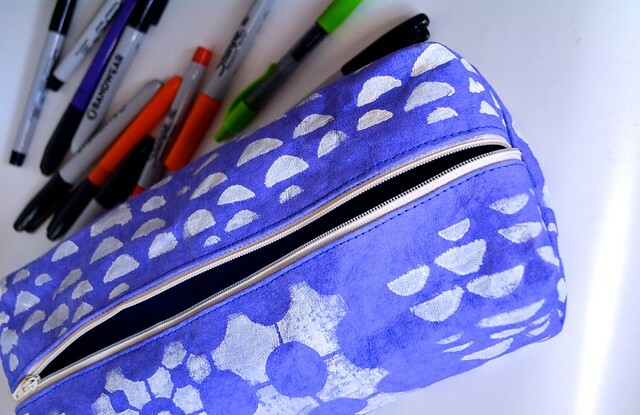 Stenciled Kraft-tex Zipper Pouch + $50 Supplies Giveaway! Today, I'm sharing a fun sewing project I made with Stencil Girl Stencils and kraft-tex (affiliate link). 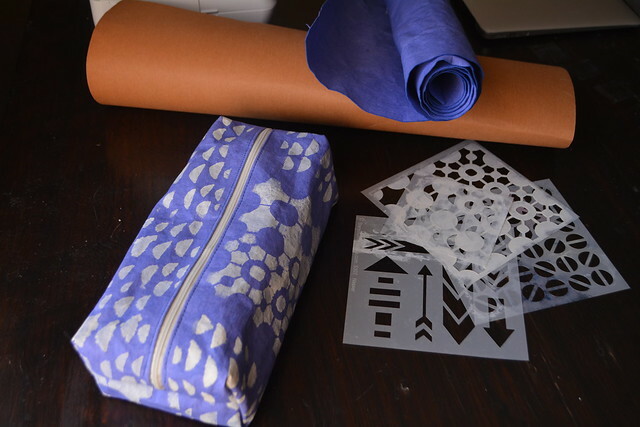 Stay tuned for the giveaway at the end of the post, so you can make your own stenciled boxy zipper pouch! When thinking about what project I wanted to make with kraft-tex, I came up with the boxy zipper pouch I've made several times. Instead of making a quilt sandwich, I used a single layer of kraft-tex, which is a substrate that feels like strong paper or flexible leather. It's very strong... much stronger than I expected! Click here for the full pouch tutorial! I experimented with a few different types of ink or paint with the stencils, using what I had around my house. Here's my favorite method of stamping! 2) Spray back side of a Stencil Girl stencil with repositionable adhesive and press to the kraft-tex. 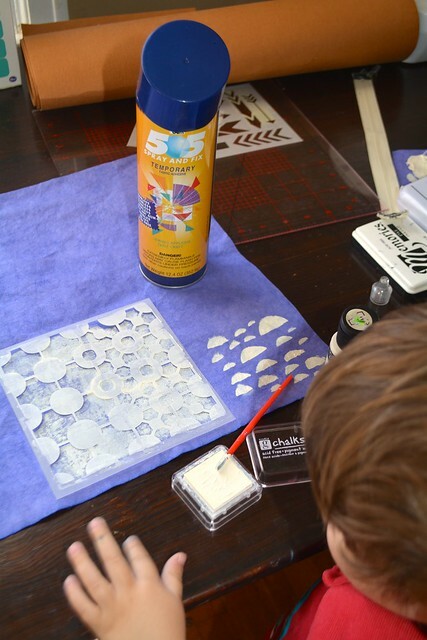 3) Using a makeup sponge, apply some craft paint over the stencil. Repeat across the entire surface. Here's what my kraft-tex looked like after I stenciled one side completely. I didn't worry too much about being precise, because I knew the fabric would wrap around the pouch in my project, and I wanted that organic, hand-stamped look. I love my new boxy zippered pouch! If you aren't famliar with Stencil Girl Stencils or the awesome kraft-tex, I'd encrouage you to give them a try. Leave a comment on this post telling me what you'd make with kraft-tex and Stencil Girl Stencils! 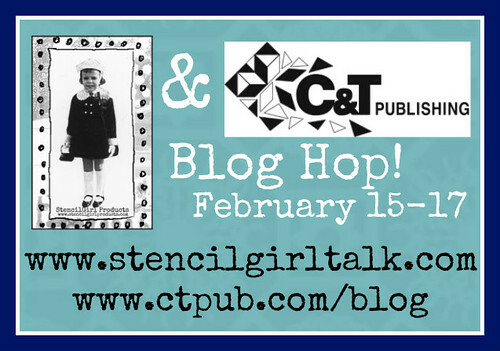 One lucky winner will receive a $25 Gift Certificate to StencilGirl Products + a $25 Gift Certificate to CTPub.com! Visit the fabulous designers from both teams and comment for your chance to win! The more blogs you comment on, the more chances you have. One comment per blog, please. Enter by Saturday, February 18th at 11:59PM CST. One lucky winner will be announced on StencilGirl's Facebook page and C&T Publishing’s Blog on Sunday, February 19, 2017. What a great idea - you can make your bags/pouches to size - for whatever materials you want to store in it. The only problem is, for me, I don't own a sewing machine. Wow - so creative. Thanks for the share and opportunity to win. THis is such fun! Love this idea of decorating and making your own bag! I would so love to learn to make a pouch. I definitely need to try this. Great pouch. I need to learn to make something like that. Wonderful idea. I wish I'd wake up one morning to find I can sew. Hi Lindsay, I love your pouch. What a wonderful project and color. I love the stencils you used. So fun. Thanks for the links too! What a neat pouch and great use of stencils. That kraft-tex really allows you to do a number of different projects. Cool! NEAT LITTLE POUCH! THANKS FOR SHARING! Love your project and loved the blue color! I think I might try a carry bag, love the stenciled surface. I would love to use them to make book covers. I would definitely sew up a bag. A clutch to be specific. Would look great and be handy especially in summer. Love your pouch! I've been wanting to make one of my own but I'm intimidated by the zipper :D You've inspired me to give it a try, though! Thanks! I'm not familiar with Kraft-tex so I'm not sure what I would make! That pouch is awfully cute though, so I could try something like that. Kraft-tex seems so versatile - I have to try!!! I definitely want to try Kraft-tex now. Your pouch is gorgeous! Lindsay, I love this! 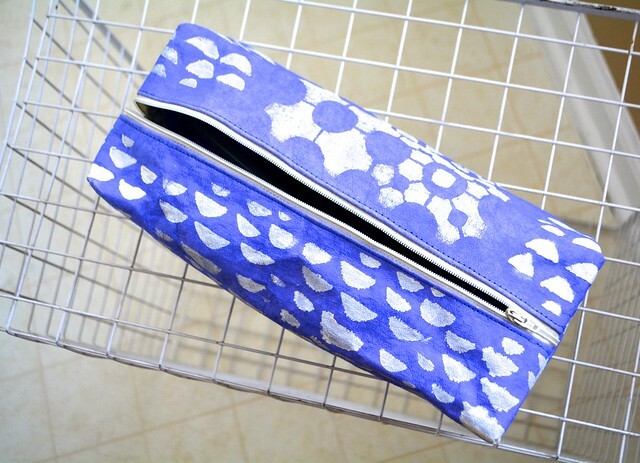 I'd love to try stenciling on the fabric for an Aeroplane bag! Wonderful, I have been wanting to make a messenger bag. This looks so easy and fun! Thank you! I would start with a pouch then a bag. So cute! I wish I could sew! Loving all of these Kraftex projects! Love your pouch! I would try to make some pouches too~ it looks so fun! Thanks for the chance! Love your pouch. Not sure what I would make, but I'm sure it will be great!! I adore zip pouches...would have to make one! I like your project. I would make a tote by request for my grandaughter. I would love to make cards and possibly makeup bags it all. I'm sure I'd have other ideas too. What a cool zipper pouch!! 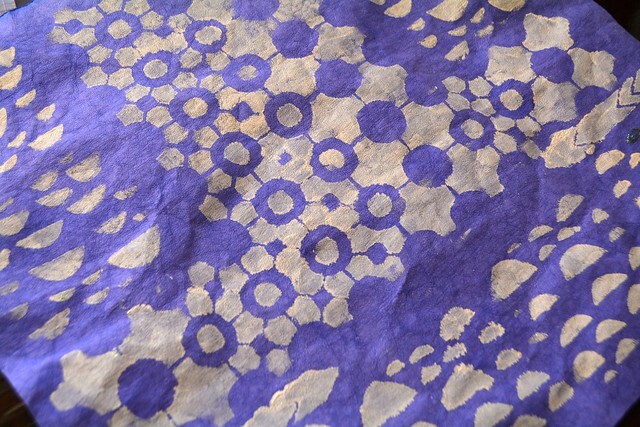 I would love to try some mixed media projects with this amazing material and stencils. Wow! That sure is cool and original!!! I'd love to create designs on fabric for cushion covers!! 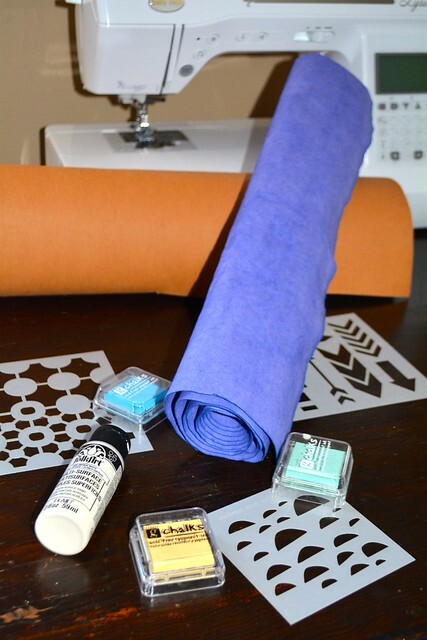 I've been wanting to try printing/stencilling on fabric this year and this looks like fun! I can always use more zippered pouches so a boxy pouch out of Kraft-Tex would be a great first project. Thanks for the chance to win. Very cute bag Lindsay. I am definitely going to try your zipper pouch pattern! I think making a pouch is a great idea, as I'm always struggling with the best way to finish my seams on fabric pouches! I'd go for some quilt blocks to frame. This is a very creative project. love how your pouch turned out. shared your tutorial with a friend of mine. I think she will really love it. thanks so much for sharing. The pouch is fabulous - perfect for journaling tools! Wow, this looks easy enough for me! Zippers scare me, but i need to conquer this. Travel plans this summer & wanting to make myself a custom cosmetic bag. Thanks. Love how your lil one gets to help. This is amazing!! What a cool material to work with. I only wish I sewed. Cute pouch. Kraftex looks very interesting. I really like how this product takes to wet media! What fun! I am liking what I am seeing here! THanks for the inspiration. I have never used this kraftex before but its now on must buy craft shopping list.After viewing todays 3 blogs this stuff has so many uses and so many ways to be decorated.I love you zipper pouch and am in need of a new pen pouch and will be make yours out of some painted canvas. I, too, am not much into machine sewing these days, but it looks like I could make and decorate some great Journal covers. This looks like a lot of fun! I'd love to make a few unique grocery totes and personalize them with my favorite colors and fabrics. I'm tired of using the same ol' bags! Kraft Tex sounds awesome with the stencils! Can not wait to try this! Need to order some Kraft-Tex soon. Love creating my own fabrics. What a cool-looking pouch! Love that purple kraft-tex with white stenciling. Terrific idea ... thanks for sharing. So fun! How great would this idea be for a set of matching pouches for your luggage? I think I'll make a journal cover and matching pencil pouch. My daughter could use some cute glasses cases that could be stashed all over. The kraft-tex takes the stenciling so beautifully thanks for the demonstration. Love your project. I'm not a sewing person, but would love to try!! I'd probably use this material to make covers for my little gratitude journals...always on the lookout for textural papers/materials. Looks like I can't spell Kraftex in my other posts--oh, well! So it comes in blue, too? Better and better! I love its toughness! Would love to try this! Looks like lots of fun. Wow! Makes me want to drag out the old sewing machine! Love that zipper pouch! It would really come in handy for storing some art supplies! Love the boxy shape, very useful. This is one cool pouch! Thanks for sharing your creativity!